From the UK. Also produce a line of decals, figures, accessories and diorama items. RM ASG Centaur Conversion For the Revell Cromwell kit. Adapts the Cromwell Mk IV into a 95mm armed Centaur as used by the Royal Engineers Armoured Support Group. The set includes pierced rubber roadwheels, deep wading trunking and options to fit the howitzer as a straight replacement or with deep wading protection. RM ASG Cromwell upgrade For the Revell Cromwell kit. Replacement turret which incorporates an all-round vision cupola, a replacement glacis plate with the facility to open the driver's port, a 95mm close support howitzer to convert the Cromwell to a Mk VI and an etched brass mini-fret to embellish the stowage and provide some interesting accessories. A line of 1/76 scale accessories that should be suitable for some 1/72 scale model applications. Assorted Handwheels A set of 21 handwheels measuring 4mm, 3.5mm, 3mm, 2.5mm, and 2mm. Presented as an etched brass sheet with three and four spokes. British AFV Stowage The set comprises 4 Jerry Cans, 2 5-gallon 'flimsies', 4 1-gallon oil cans, 2 ration boxes, 2 biscuit tins, 2 5-gallon oil drums, 2 mortar boxes, 2 shovels and 2 pickaxe blades. German AFV Tools set 1 A set of twelve items cast in resin to embellish late-war panzers. Included in the set are: hammer, shovel, axe, lever arm, extinguisher, C clip, jack, jack block, bucket, Bosch headlamp, cleaning rod tube, and cupola MG mounting. C-76057 Steering Wheels A set of nine useful steering wheels. These are ideal replacements for over-scale plastic kit parts or fragile resin kit parts. They are supplied with three and four spokes in two sizes. C-76068 British 40mm Bofors Gunsight (Late War) This etched brass set recreates the frame gunsights used on British 40mm Bofors AA in the late war period. C-76070 US 40mm Bofors Gunsight (Late War) An etched brass set which recreates the frame gunsights used on US 40mm Bofors AA guns in the late war period. C-76071 British 40mm Bofors Gunsight (Mid War) This etched brass set depicts the gunsight used on British 40mm Bofors AA in the mid war period. C-76072 US 40mm Bofors Gunsight (Mid War) An etched brass set that recreates the gunsight used on US operated 40mm Bofors AA guns in the mid war period. C-76077 Petrol or water frames A set of five different PoW frames - two of each, so ten in total. The frames are made of etched brass and simply fold to recreate this stowage which was so emblematic of British motor transport. C-76078 Carrier Dust shields This set has two different types of dust shield - two pairs of the early type, three pairs for the later type, so five vehicles worth. 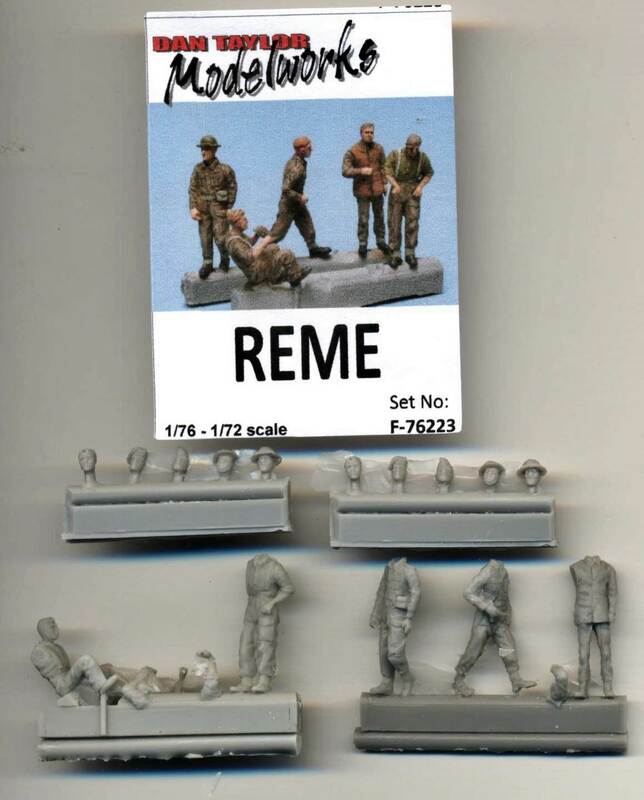 They are designed to be compatible with the Carriers by Airfix, Milicast, IBG and Plastic Soldier. C-76079 Sherman enhancements The set contains parts to modify two Shermans. Each fret has brush guards for front and rear lights; six skids for the top of the roadwheel bogey units; an antenna base; and a sighting vane. A line of 1/76 scale decals that should be suitable for 1/72 scale model applications. DTM-T-76007 27th Armoured Brigade Set 3 (East Riding Yeomanry) This sheet has transfers for 2 Sherman Mk III (early), 5 Sherman III (M4A2) mid, 1 Sherman Vc Firefly, 1 Humber Scout Car (Brig. Prior-Palmer), 1 Universal Carrier with deep wading outfit for 13/18 Hussars. DTM-T-76008 Sword Beach Vehicles This set contains 5 Deep Wading Carriers, 3 Jeeps, 2 CMP HU Ambulances, 2 D7 Dozers, 1 Sherman BARV, 1 M10 Tank Destroyer, 1 M9 half-track & 1 Austin K5 truck, on D-Day. British minor landing craft. OOP. It includes decals for twelve different craft including LCA's, LCPL's, LCPR's, LCMI's and LCM3's. US minor landing craft. OOP. It includes decals for eight different craft including LCA's, LCPL's, LCPR's, LCVP's, LCM3's and LCM6s. DTM-T-76013 22nd Armoured Brigade Set 2 (4th CLY/5th RHA) This is the second set for the 22nd. Armoured Brigade, complimenting set 76002, and has markings for 19 vehicles, mainly 4th. County of London Yeomanry but also including the three RHA OP Tanks at Villers Bocage, Normandy, June 1944. DTM-T-76014 22nd Armoured Brigade Set 3 (5th RTR/5th RHA) This is the third set for the 22nd. Armoured Brigade, complimenting sets 76002 & T-76013, and has markings for 10 specific vehicles plus a number of generic markings covering 22nd Armoured HQ, 5th RTR & 5th RHA. Vehicles covered include M3A3 Stuart, Crusader AA MkIII, Cromwell IV, Cromwell VI OP, Sexton 25pdr SPG & Bedford MWD. DTM-T-76016 Gold Beach D-Day & 8th Armoured Brigade This set is specifically designed for vehicles photographed in and around Gold Beach on D-Day plus numerous generic markings for the 8th. Armoured Brigade and 5th. Assault Squadron RE in Normandy 1944. DTM-T-76017 2.Kompanie s.SS.Pz-Abt 101 This set consists of the turret numbers plus all the unit markings and national markings for all of the 14 Tigers of SS. Pz Abt 101(2 Kompanie) plus two of the Command Tanks from the Abteilung's HQ troop, including Wittmann's Tiger, Normandy, 1944. DTM-T-76018 BEF Set 1 7th RTR Matilda II This set comprises the markings for all 23 Matilda Mk.II's of the 7th. Royal Tank Regiment in France, May 1940. DTM-T-76020 BEF Set 3 Softskins 1 This is a mini-set including markings for two Ford GOC1 8-cwts, a Bedford OY, Scammel tank transporter and a couple of Morris 15cwts. DTM-T-76021 Lanchester Armoured Cars This set comprises markings for 6 Lanchesters of 2nd Argyll & Sutherland Highlanders, 11th Hussars, 12th Hussars & 23 Armoured Car Company. DTM-T-76022 29th Armoured Brigade & 11th Armoured Division HQ This set is designed for 3 A27M Cromwell Mk.IV Command tanlks, 1 M3A1 Scout Car, 1 Sherman Mk.V Command tank, 1 Humber Scout Car, 1 Bedford QLD of the 29th Armoured Brigade plus numerous generic markings for the 11th Armoured Brigade and vehicles from the Divisional HQ in Normandy 1944. DTM-T-76023 2nd Northants Yeomanry & 11th Armoured Division Royal Artillery This set covers the vehicles of the 11th Armoured Division Armoured Recce Regiment plus markings for the divisions Sextons & M10's. Normandy 1944. DTM-T-76025 5th Guards Armoured Brigade -Set 1 The set has markings for 14 Sherman Mk V; 1 Sherman Mk Vc Firefly; 2 x Humber Scout Cars; 9 x Stuart Mk VI Light Tanks; and 1 M9A1 Half-track. DTM-T-76026 33rd Armoured Brigade - Set 1 The set has specific markings for 5 x Sherman Mk I; 1 x Sherman Mk I Hybrid; 2 x Sherman Mk Vc Fireflies; 1 x Humber Scout Car; and 1 x Stuart Mk III Light Tanks. Additional turret numbers are supplied so that additional vehicles may be modelled. DTM-T-76027 II Abteilung, Panzer Regt Lehr Markings for five specific tanks based on photographic reference are provided. Markings for a further fourteen tanks are included and the numbers have been chosen so that, given a little mixing and matching, all of the units Panzer IVs could be modelled. DTM-T-76028 II Abteilung, SS Panzer Regt 12 A number of markings for specific vehicles are provided along with some generic numbering to allow you to make up any tank from the Abteilung. DTM-T-76029 2 Btn Welsh Guards The set includes specific markings for 2 x A27M Cromwell Mk IV plus a number of generic markings to help build other vehicles from the unit. C-76080 Folding Furniture The set consists of two folding tables, two folding canvas chairs and six folding wooden chairs. The tables and wooden chairs may be built as folded or open. British Home Front Set 1 Propaganda Poster set. Germany/Occupied France Propaganda Poster set. P-76033 British Home Front Set 2 Propaganda Poster set. A line of scale figures that are advertised as 1/76 but often measure up as being 1/72. The heads set can also be used for 1/72 scale model applications. Oerlikon Crew This set comprises six gun crew figures - sufficient for two Oerlikon crews. British Infantry '44 - set 1 A set of five unpainted resin figures in standing poses awaiting their next move. They are sculpted in full battle order and included in the set are a Sten Mk III, A Bren LMG and three Lee-Enfield Rifles. British Infantry '44 - set 2 A set of four scale figures in relaxed poses - an officer replacing his helmet, two men standing casually, and the forth smoking a pipe, hand in pocket. 76BI04 Beach Group, RE A set of five standing figures: two standing; one leaning; one sitting; and an officer walking. 76BI05 Dock Group Four standing figures - an RAC officer with arms crossed, two dock workers and an RAC NCO with hands on hips. 76BI07 British Infantry - Seated - set 1 This is a set of five figures in various poses. Nine heads and three arms are supplied separately so that they can be posed to add character. The set comes with 1 Sten Mk III; 1 Bren LMG; 3 No4 Lee-Enfield Rifles; 2-inch Mortar; PIAT; and 2 projectile carriers. 76BI08 British Infantry - Seated - set 2 Nine heads and seven arms are supplied separately so that they can be posed to add character. The set comes with 1 Sten Mk III; 1 Bren LMG; 3 No4 Lee-Enfield Rifles. 76BI09 Airborne Troops, Tea and a Wad Six glider troops having a snack. In addition to their para smocks three of them are wearing the special lifejackets provided to airborne participants in the invasion. Also provided is a canteen of tea and a tea chest on which one of them sits. 76BI11 British MT Drivers - set 1 Five figures with poseable heads and arms. They are ideal as vehicle drivers but would be equally at home drinking in a bar or relaxing away from the front line. 76BI12 British MT Drivers - set 2 Five driver figures in various poses. They come complete with poseable heads in different headgear plus some arms which can be fixed as desired. 76BI13 British Carrier Infantry Seven resin figures in seated positions suitable for crewing carriers and half tracks. Heads wearing Mk II helmets are provided on a separate sprue. There are two driver figures designed to fit within the confines of the Airfix and Milicast kits (though they will fit just as well in a number of other models). 76BI15 Glider Embarkation A set of five glider figures, wearing full rig with lifejackets. One of the figures is drawing in chalk on the side of a glider and another is climbing a ladder. 76BN01 LC/Coastal Forces Crew Six figures with alternative heads- officers and able seamen in varous poses and with a variety of uniforms. 76BP01 Officers on Parade A set of five unpainted figures suited to the parade ground. Two are NCOs in Battledress, the other three are officers in Service Dress. 76BP02 Stand Easy A set of five unpainted figure standing at ease. Four of the figures are Other Ranks, whilst the fourth is wearing colar and tie so can be finished as an officer. 76BP03 Atten-Shun A set of five unpainted figures with slight differences in face and height. 76BP05 Auxillary Territorial Service This set of four figures shows four distinct uniform types worn by the service: one in battledress with tin helmet; one in overalls; one in service dress with ATS cap; and one in service dress with coloured side hat. 76GE01 Panzer Crew - Dismounted Five Panzer crewmen tinkering outside their vehicle. 76GE02 Panzer Crew - Leather Uniform Six resin figures wearing the submarine leathers, adopted by some SS Panzer crews during the Normandy Campaign. 76GE03 Stormtroopers Three figures in the uniform of the Nazi Party. 76HF01 Police & ARP Wardens Four resin figures, two each in the uniforms of the Police and the ARP service. 76HS01 Bare Heads A set of seven different, characterful heads without headgear. 76HS02 British Mk II Helmet - plain Six heads wearing British Mk II Helmets plus one helmet by itself. Although shown as Mk II, in this scale they are identical to the Mk I. 76HS03 British Mk II Helmet - netting A set of six heads with British Mk II Helmets covered with netting plus an additional bare head. 76HS04 British Mk II Helmet - scrim This set has six heads rearing the Mk II helmet fully decorated with netting and scrim plus a spare helmet for decorating your models. 76HS05 Berets Seven heads wearing pre 1960s style berets. 76HS06 British Dispatch Riders This set of six heads wear the No3 Mk I Dispatch Riders helmet. 76HS07 Scots Bonnets Six heads wearing the Tam O'Shanter plus one wearing the Glengarry. 76HS08 British Airborne Headgear Five heads with helmets covered in scrim, one head with a plain, ungarnished helmet and a single head wearing a beret. 76HS09 British AFV Crew Headgear Seven heads designed to adorn British tank crew figures. Three wear headphones and berets, three wear headphones and helmets and the last is a bare head wearing glasses. 76HS10 British Officers Service Caps A set of five heads wearing peaked Service Caps, including one with headphones. 76HS11 Anzacs & South Africans Six heads: two wearing 'Slouch Hats'; two wearing New Zealand 'Lemon Squeezers'; and two wearing South African 'Polo-Pattern' pith helmet. 76HS12 Indian Pugrees A set of heads wearing three different sorts of Indian Pugree (two of each). 76HS13 Forage Caps Seven different heads with the standard non-combat headgear of the British Army through the early war years. 76HS15 (H-76315) French Headgear Seven heads in various styles of distinctive French headgear :the traditional Kepi, two Adrian Helmets, a 'bonnet de police' side hat, a chasseur beret and the French style AFV helmet.